In Local Heroes: About Time, powerless sidekick Squire accidentally travels back into the past, teams up with Rumble Bee against vampires, and is confronted by an evil version of himself from another dimension! This is an all-ages comic created by Keith Quinn and printed by Ka-Blam. 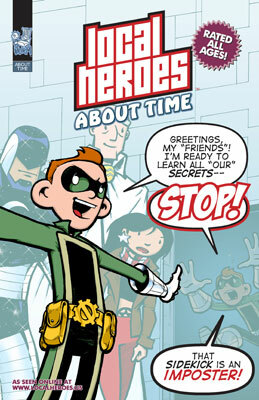 With a full-color cover and black and white interiors, Local Heroes: About Time includes all 84 strips (124 to 208) from storylines 7 through 11 of the popular online comic "Local Heroes" at www.localheroes.us.